Сергей Леонтьев, доктор медицинских наук, профессор, родился в 1957 году в г.Екатеринбурге (ныне Свердловск), Российская Федерация. Известный ученый в области биомедицины, директор Института медицинских клеточных технологий. Сергей Леонтьев автор более чем 120 научных работ. Пишет короткие рассказы и публикует их на литературных сайтах и на страницах в социальных сетях. 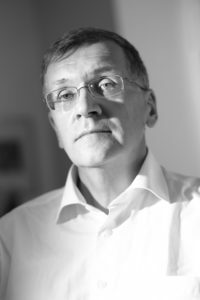 Sergei Leontiev, born in 1957 in Sverdlovsk (now Ekaterinburg), Russia. A prominent Russian scientist doing stem cell research, doctor of medical science, professor, the head of the Institute of Medical Cell Technologies. S.Leontiev is the author of more then 120 scientific studies. He writes the short stories and publishes them in the literary website and social networks. Alexei Raskatnikov, a little-known artist, whose reputation was rapidly growing a member of the Artists’ Union, an associate professor of Easel Painting Department, was standing in front of the canvas casting sorrowful glances at it. He prepared this canvas by himself. Everything was usual: he stretched a woven linen cloth around a wooden frame, secured it with staples and primed it. He did it himself not for reasons of economy: he had enough money. It was just because he liked to work on his own canvases: he was sure in their quality that way. Alexei remembered how he was preparing for plein-air: choosing paints, brushes, tuning in, pondering the plot, tracking the weather forecast. He even bought good coffee and found his old thermos in the studio. When was it? Two, oh no, three weeks ago. What a nightmare — he had not taken a brush in his hands for the past three weeks! Always hurrying and scurrying, always busy doing nonsense. Dozing off at tedious sub-faculty meetings, wasting time in the committee administering entrance examinations, looking at flat and dull works of the applicants. Vasiliev, yes, that same great Vasiliev, whose classes Alexei had attended many years ago, once warned him: “Never look at bad works, only look at good ones. Bad works leave bad impressions, create dark images, which will wash out your colors, weaken your soul and dim your eye.” Of course, Alexei did not forget how to draw: in the battle between talent and booze, talent always won. His evident artistic skills were clearly manifested in his ability to paint with a hard touch, to sketch a whole composition pluckily, to let loose his artistic inspirations through his paintings, to capture an idea on the fly and then to transfer the image to the picture, to express the mood with precise, energetic strokes, putting the only correct paints on the canvas. His complicated and profoundly elaborated canvases were always striking in their multifacetedness and content. Despite being still comparatively young (less than forty), he had already had several successful solo exhibitions, laudatory reviews of art critics and interesting orders. But three weeks without painting was too long! Vasilyev would have killed him. That’s enough! Tomorrow he would get up early, perhaps, at five or half past five, and go to the park. Let the devil take the hindmost! Until he finished his etude he would not go to the Academy. He was fed up with them! They would have to do without him. At ten minutes to five Raskatnikov woke up without any desire to get out of bed. For a long while he was lying with his eyes closed, trying to make himself get up. “What’s going on?” The idea of getting out from under the warm blanket seemed terrible. Even less he wanted to go somewhere. But this reluctance was understandable and natural, while his unwillingness to paint scared him. Where was that Alexei Raskatnikov, who being a college student was constantly surprising his mates and teachers with insatiable lust for work? That Alexei Raskatnikov, who was drawing everywhere and on everything: on tickets, wallpaper, napkins in the dining hall, on toilet paper and even on the back of the exam tickets, for which he was once kicked out of the classroom. If the assignment was to draw a still life, he painted two. Instead of two compositions, he presented four. When entering the Academy, he nearly buried the admission committee amongst his works. Will it be the same as before? Was he again going to lie torpidly in bed, waste a day and then suffer, get angry, displacing his bad mood and anger on to innocent colleagues and students? No, it’s time to get up! Having pulled himself together, Raskatnikov bounced out of bed, as he did serving in the army, quickly got dressed, drank a cup of strong coffee and cheered up a little. He was painfully trying to figure out what was wrong with him: whether it was a result of accumulated exhaustion, or a creative crisis, or something even worse? Sure enough, he had been overloaded for the past few months. Freelancing would be an issue but unsafe money margin did not allow him to start it right now. Moonlight jobs, extra classes in the Academy, work with future students, teaching amateurs were quite a routine for him. And now that time consuming work in the admission committee. But he had lived through far more painful times, and yet he was always willing to paint. Vasiliev was goddamn right. Artists should not look at bad paintings. Let’s take for example, the works of that…. what’s her name … ah, Solovyova. She herself looks lardy, obese, untidy, and her pictures — ewww -… . He even shuddered in disgust, it was anything but painting! A stupid stale jumble on each canvas! The day was breaking outside. His car packed and stuffed since evening blinked and winked cheerfully in response to the alarm deactivated. It took him just fifteen minutes to get to the park. But the weather was not favorable. The forecast had promised a sunny day. However the sky was covered with murky, dark-grey clouds. No sooner had he got to the right place and set up his easel, it started to rain and it seemed that it was not going to quit for the rest of the day. Perhaps, his gloomy mood, coupled with murky weather was too much. Evidently, coffee was not the best idea for bringing along. Should he fix this problem in the nearest shop? Alexei opened a large umbrella and tried to focus on what he was doing. But it did not work out. His brushes got utterly harsh, the hand languid and awkward, the paints were pale and hostile. He spent twice as much time on the underpainting than usual. To make matters even worse it got windy. Alexei got very cold and started shivering. It was necessary to buy some vodka to get warm. But who could he ask to keep an eye on his sketch box? Alexey looked around. There were almost no people in the park because of the weather. A-ha, here, perhaps, was a suitable one. The person was so outstanding that Alexei forgot about his bad mood. Straight toward him and oddity of uncertain age was advancing with long, swinging strides. He had a black spade beard, which looked rather shaggy, and grey matted hair sticking out from under his shapeless squashed hat. His body was almost completely covered with a long, striped, severely worn-out chlamys flapping when he was walking. On his feet Alexei noticed splendid one-size-fits-all black and surprisingly clean and shiny boots as if they were just polished. The face! It deserved a separate description. It was wide and asymmetric with a large mouth and prominent fleshy nose with deep grooves on it. Deep wrinkles in his face and leathery skin spoke of hard living. He had deep-set brown eyes under thick black eyebrows. — What a character! — thought Alexei. — An exquisite creature for a portrait. Not burdened by inferiority complex, the stranger confidently broke into Alexei’s workspace and carelessly pushed back the bag with paints and brushes, which was in his way. Leaning against Raskatnikov’s arm, he was gazing silently at the canvas for a few minutes, mumbling thoughtfully in his moustache and muttering something inaudibly. Surprisingly, the stranger did not have the odor of trash cans or dirty unwashed body. In addition, at a closer look his clothes were quite clean. Alexei realized that the intruder’s appearance was completely different from a familiar image of an urban vagabond. – Draw how the Lord comes to people, — unexpectedly said the stranger with a pleasant deep bass voice and surprisingly lively and cheerfully looked into Alexei’s eyes. – I cannot paint anything I haven’t seen, — said Alex, as if he was trying to find an excuse. – The Lord has never appeared to me. Raskatnikov’s relationships with the Lord were somewhat strange. He was raised in a family who were third-generation atheists. His great-grandfather personally knew Ulyanov-Lenin and supported him wholeheartedly, although he did not entirely agree with the prevailing doctrine of the communist party. Eventually in 1937 he was exiled to a far more remote place than Lenin, his wise and beloved leader and guru, was sent in the times of his own political struggle. In exile, the great-grandfather passed into nothingness, which, however, did not influence the ideological basis of the following generations. Never-the-less, neglecting his family traditions, Alexis got baptized, when he was already an adult, but he did not go to church. Was he a believer? Well, it looked more as he was than wasn’t. – Why do you say He has not come to you?» The stranger sounded sincerely surprised. — You are a painter, which means that He has come to you. I’m a poet. So, I was visited by Him too. I wish I could draw, but I can’t. Words are sort of my way, would you like to listen? Suddenly Raskatnikov felt a tingling sensation in the fingers of his right hand. He immediately recognized that fever: it usually preceded inspiration. The whole thing around changed in a shot. It stopped raining, as if it never did, the wind died down, the sun came out, the paints became bright and fresh again. He hand became light and accurate. He was working quickly, his brush moving in swift, confident strokes across the canvas, on which a picture was quickly appearing, as if it was a photo paper being developed with the use of some reagents. Alexei knew that the painting was bound to be a very good piece of art. As always in a fit of inspiration, he had a feeling that it was not him who was doing it. His hand was driven by a mysterious higher power. Time seemed to stop, but it didn’t matter. “Important” was something else, something that did not have an exact definition. It combined inspiration, creativity, creation, nascency of something new and beautiful. Alexei was almost finishing his work, when he suddenly remembered about the stranger. The man had left. Gone to get down to his poems? Wasn’t it surprising, how the Lord appeared to people! Who would have supposed? Far in the distance, where the stranger had gone, a barely visible beam of light was rising from the ground, turning brighter and more noticeable with the height, as if a little star had just silently ascended to the blue heaven.